Listen, connect, and convert. 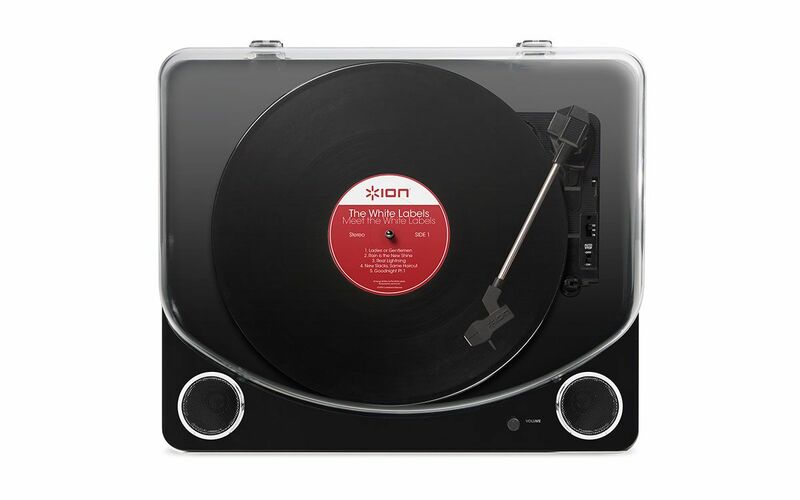 Max LP™ is a simple all-in-one turntable that makes it easy to enjoy your records and convert them to digital music files on your computer. With Max LP, transferring your 33 1/3, 45, and 78 RPM records to a Mac or PC is easy. Just connect Max LP to your computer with the included USB cable to get started. ION’s exclusive EZ Vinyl/Tape Converter software guides you through the steps and automatically separates the tracks into individual files. Convert from other audio sources, like a cassette player, using the 1/8-inch auxiliary input. Max LP comes with built-in stereo speakers so you can just kick back and listen to your records. You can connect Max LP directly to your home stereo system using its standard RCA outputs, and its high gloss black lacquer finish compliments any room. A headphone output is also built-in for private listening.